Product #2424 | SKU JAA801DA | 0.0 (no ratings yet) Thanks for your rating! 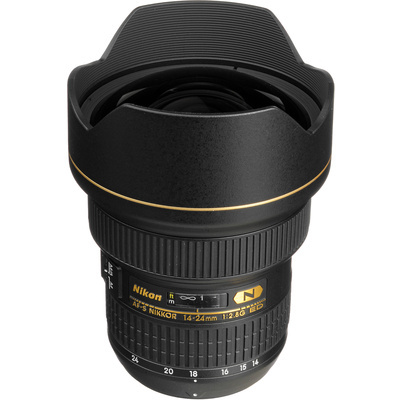 The Nikon AF-S Zoom 14-24mm f/2.8G ED AF Lens is an extreme ultra-wide zoom, wide-aperture lens that delivers edge-to-corner sharpness that can surpass that of equivalent fixed focal-length lenses. It features a Nano Crystal coating to reduce the effects of ghost and flare, combined with 2 ED (Extra-low Dispersion) elements and PGM aspherical lenses that help control chromatic aberrations. These all combine to enhance sharpness and contrast. The Silent Wave Motor (SWM) feature provides swift autofocus with superior accuracy and ultra-quiet operation. This G-type lens does not feature an aperture ring on the lens body, resulting in a lighter and more compact lens. Aperture changes are designed to be done via the camera's command dial. AF-S feature is not supported by certain older camera models. "G" type lenses are not fully compatible with the F4, N90-series, N70, N8008-series and N6006 (or older model) cameras, only programmed auto or shutter-priority auto exposure mode can be used.